Traxxas E-Revo/ Revo and Summit Parts. Polished front and rear bumper set for the Traxxas REVO. These bumpers are 1/4" thick! Good luch ben..
Alum. Battery Cover for the Traxxas REVO. CNC'ed alum. Color: Silver ..
Gear Set, Two-Speed standard ratio(2nd speed gear 39T, 13T-17T input gears and hardware. Fits Rev..
Glow Plug Wench, TRX This wrench can be used for all Traxxas Nitro vehicles. T-Maxx, REVO, Rustle..
Header, Exhaust Silver, TRX 2.5R/ 2.5 .. These are basically the same design as MIP CVD's. Just a little better price. These have a black oxi.. 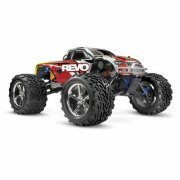 Fits Traxxas E-Revo. Add some flashy looks to your ride and upgrade performance and durability at t..
Set includes everything needed to hop up your Revo with a alloy front body & pin mount. Blue ..
Set includes everything needed to hop up your Revo with a alloy front body & pin mount. Silver ..
Set includes everything needed to hop up your Revo with a alloy rear body & pin mount. Blue &nb..
Set includes everything needed to hop up your Revo with a alloy rear body & pin mount. Silver &n..
Killer looking alum. parts. CNC'ed, tumbled and then anodized a bright BLUE. Includes: 2 Servo Gu..
Killer looking alum. parts. CNC'ed, tumbled and then anodized a bright BLUE. Includes: 1 trans. g..
Killer looking alum. parts. CNC'ed, tumbled and anodized Blue. Includes: Fuel tank guard. We also..
Killer looking alum. parts. CNC'ed, tumbled and anodized Clear. Includes: Fuel tank guard. We als..
Killer looking alum. parts. CNC'ed, tumbled and then anodized a bright BLUE. Includes: 1 skid pla..
Killer looking alum. parts. CNC'ed, tumbled and then anodized clear. Includes: 1 skid plate. I..